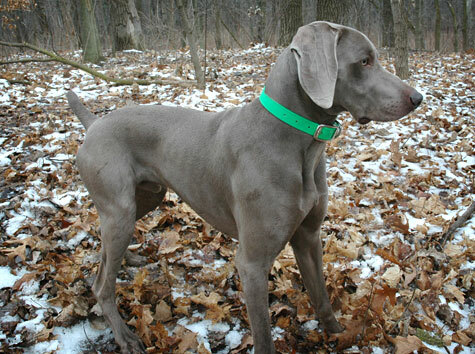 It was Stuka’s turn today to get out for a run in the woods, and perform some ground work. We started with a short walk in the woods to help expend some energy. The temperatures were a bit warmer than yesterday, however it was more overcast. Stuka was very active…and frequently found sticks to carry. Interestingly, he is a very “nose down” kind of dog. Continuously sniffing the ground, whereas Elsa tends to be a little more “heads up”, even looking in the trees at times. 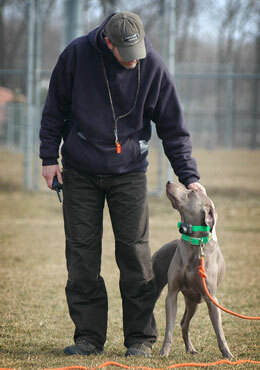 The exercise worked out well as it allowed him to focus on training exercises later in the day. A few hours later we drove Stuka over to a local high school practice field that was entirely fenced-in. This provided a good environment for him to simply drag a 12′ check cord with limited distractions. We focused on drills involving 1) quartering, 2) whoaing, and 3) retrieving. When quartering, Stuka was worked left-to-right on the check cord and instructed to turn at a single blast of the whistle. This exercise was eventually done hands-free. If Stuka did not comply, he received mild stimulation from the collar. The moment he turned properly the stimulation ended. This provides him an impression that he turned off the stimulation, and reinforces the conditioning. Stuka’s been whoaing very well since a puppy, so I focused on increasing the distance and duration of his whoas. To do this, he was put into a whoa, then I walked in large circles around him occasionally changing direction or approaching him, then walking away again. During this exercise, I tried not to pay too much attention to him, and if he took a step he received a mild “nick” from the collar. Retrieves were done with a wing covered canvas bumper. The retrieves were kept short…the distance does not matter at this stage. The focus here was on returning the bumper versus running away or simply chewing on it. Keeping the retrieves short also lets me grab hold of the check cord if necessary and reel him in. All the exercises we performed during the training session were mixed up and kept relatively short to ensure boredom did not become an issue. The point was to keep each task fun…and why shouldn’t they be? These basic exercises will eventually build upon each other and come together in “real world” hunting situations. One more important step…when Stuka did something incorrectly, we calmly repeated the task. Getting angry, frustrated, or yelling only enforces negative conditioning and does not support the teamwork that will be necessary later when presented with unplanned events in the field. Of course, when things went well, Stuka received ample praise.